I thought I should get this up before everyone's Fourth of July sketches go up. 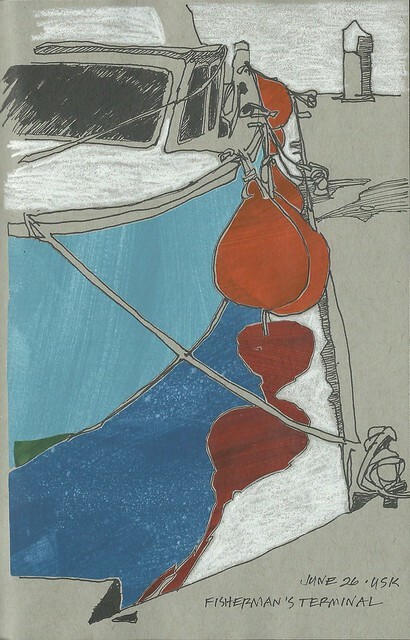 This was the second drawing I did at last week's outing at Fisherman's Terminal. I got a contour drawing done and some white highlights on the gray Strathmore paper during the meetup. But when I got it home and started playing with some hand-painted collage papers, it became my favorite sketch for the day! I really liked the shapes of the fenders hanging off the side of this fishing boat, and the reflections in the water. Really nice, Sue -- bold, graphic, almost abstract! Beautiful Susan. I love your bold graphic style.